As part of Australia’s Kinderling Radio series, “Kinderling Conversations for Parents,” I recently had the pleasure of once again getting to sit down in Sydney with radio host extraordinaire, Shevonne Hunt for a heart-to-heart discussion about the ever-important parenting topic: young children and their (sometimes challenging) sleep habits. Feel free to tune in and listen to this 16 minute discussion. “Lights out” is a very common phrase meant simply to imply that it’s time to go to sleep. In days past, our ancestors lived their lives according to what was a naturally determined version of “lights out” – typically rising with the sun and turning in when it set. Over the last century, however, we have been given far more control – now able to not only artificially and technologically manipulate our light exposure, but prolong it to such an extent that some of us live our lives in a state of nearly 24/7 light exposure. Given this fact, along with all we now know about what it takes to get a good night’s sleep, it occurs to me that it’s high time for “lights out” to be seen in a new light. According to the National Sleep Foundation, 90 percent of people in the US admit to using an array of technological devices – from TVs and tablets to smartphones and laptops – during the hour before they go to sleep. The problem with this tech-heavy approach, simply put, is that darkness matters. Insufficient darkness not only delays the onset of sleep, but also leads to more frequent and prolonged wakenings. Light exposure is one of the most powerful signals in our environment when it comes to setting the body’s internal clock – a biological “clock” responsible for determining our sleep-wake cycles (also referred to as circadian rhythms). Keeping in mind this simple concept, the reasons for the following common sleep-enhancing tips should become both more obvious and enlightening. Rise and shine. Like “lights out,” rise and shine is an expression – as well as a piece of advice – that comes with plenty of supporting evidence. Exposure to sunlight (or bright, blue light) in the morning and during daytime hours is known to reinforce your body’s natural sleep-wake cycle and signal that it’s time to be awake. Face (smart)phone facts. 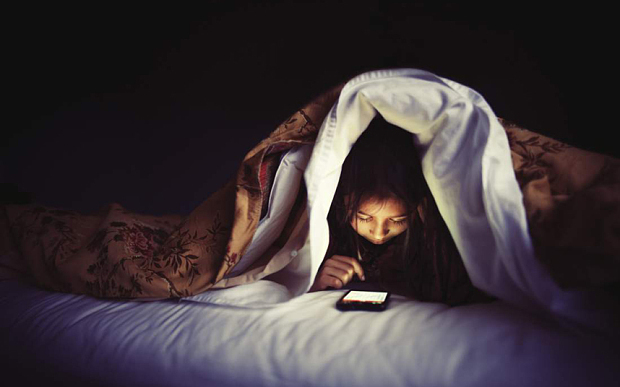 The screens on smartphone typically give off bright blue light – a design feature meant to help make them easier to see even in bright sunshine, but one that unfortunately comes with potential sleep consequences. Designed to mimic sunlight, this blue light is considered worst with respect to throwing off your body’s sense of day and night. The solution? Reduce your exposure to bright and blue-rich light in the evenings (generally recommended 1 to 2 hours before bedtime). If you find yourself unable to set aside your phone altogether, the iPhone added a new feature (in iOS 9.3) called Night Shift that allows you to shift to “warmer” and less eye-opening hues by cutting down your exposure to the harsher blue light at bedtime. Electronic-free bedrooms. Smartphones aren’t the only offenders when it comes to devices that interfere with getting a good night’s sleep. Common sleep-enhancing recommendations also routinely include turning off and/or keeping all close-range electronic devices (ie those which emit blue light) out of the bedroom. While phones, tablets and other screens definitely fall into this category, don’t forget to consider (and remove) chargers, sound machines, and other blue-light electronics and accessories as well. Choosing the right nightlight. Nightlights have increasingly become the subject of scrutiny in light of what we now know about sleep/wake cycle disruptors. This seems to be especially true for parents wondering whether or not to install nightlights in their bedrooms. Clearly, blue-emitting nightlights are not a good idea. But apparently, white light isn’t so great either. For those committed to using a nightlight, it seems that red light might be your best choice. From a practical parenting standpoint, however, I will point out that newborns enter into the world already well-accustomed to sleeping in the dark. As much as possible, it would seem best to keep it this way, rather than introducing them to artificial light at night. The bottom line is that sleep is something we all do, and that we all need. It is also one of those key aspects of our everyday lives that all too often gets too little attention…that is, until we find ourselves fatigued. Representing much more than a casual expression, “lights out” now represents a succinct yet valuable piece of advice that, firmly supported by the latest in sleep science. It is my hope that by shedding some light on this important issue, you will see the value of turning out the lights, shutting off the screens, pulling the shutters and, at least in this particular instance, choosing to remain in the dark. Back-sleeping and tummy time are common phrases in today’s parenting lexicon. Yet that hasn’t always been the case. The Back to Sleep Campaign – primarily responsible for the switch to back-sleeping babies and related recommendations for tummy time while awake — was launched in the mid-1990s to educate parents, caregivers and health care providers about ways to reduce the risk for Sudden Infant Death Syndrome (SIDS). At the time, this represented a big parenting shift. Before this public education campaign, parents had little reason to think twice about putting babies to sleep on their bellies. Generations of parents routinely did so. But with compelling evidence to support the Back to Sleep campaign’s primary message — that placing babies to sleep on their backs reduces the risk for SIDS (sometimes referred to as “crib death”) – great progress was made in helping babies sleep safer. Just how much progress? It is estimated that since the campaign started, the percentage of infants place on their backs increased dramatically while at the same time, overall SIDS rates decreased by more than half. As far as public health campaigns go, the Back to Sleep campaign is a hands-down success, and the benefits of raising back-sleeping babies and creating safe sleep environments are as clear as ever. What isn’t always so clear, however, is how parents and caregivers should go about compensating for all this additional time that babies spend sleeping on their backs. By compensating, I mean tummy time. Encouraging back-sleeping babies to spend awake time on their bellies can help stave off the dreaded “positional plagiocephaly,” more understandably referred to as a flat head. This all might sound fairly straightforward, but I am routinely asked about, interviewed on, and pressed on the subject of tummy time (and the challenges it seems to pose). How much time should babies spend on their tummies? What can one do to encourage tummy time? Is there a certain position babies should be put in? What if they don’t like it? My first child was born right around the time that the Back to Sleep Campaign was really taking hold. As a pediatrician-in-training, I was well aware of the recommendations, and my daughter didn’t seem to have any problem following them as she established herself as a very good back sleeper. The problem was that I was far more comfortable with the recommendation for her to spend plenty of time on her tummy while awake than she was. Every time I put her on her belly, she’d squawk, cry, push off with her feet, and convince most everyone around her that she was in great distress. I managed to convince myself that her tummy time displays weren’t truly those of a distressed child, so she did get in a sufficient amount of tummy time. I find, though, many parents find tummy time troubling. Try the following tummy time tips and tricks to help take the pressure off of you as well as your baby! Tummy timing: The key here is quite simple. Just remember back while sleeping and tummy while awake. Despite what you may have been led to believe, there are actually very few rules about how much time a baby needs to spend on his tummy. There’s no need to set a timer, mark your calendar or otherwise formalize what essentially boils down to a simple concept. Just make sure your baby sleeps on his back, and then I commit to trying to make tummy time your baby’s default for hours when he’s awake. Make tummy time a habit. I’m well aware that this may sound like stating the obvious, but it has been my experience – both in dealing with parents and with child care providers – that laying a baby down on her back seems to be somewhat of a force of habit. That’s great if you’re talking about a baby who’s going to sleep. But if it’s on the floor or a playmat, for example, it can take a conscious effort to switch to the routine of placing an awake baby on her tummy. Understand the benefits. There’s no magic to tummy time. Simply put, until they learn to roll, sit and crawl, babies generally spend an impressive amount of their time laying down. If all of this down time is spent with pressure being put on the same spot(s) on the back of their skull while it’s still somewhat soft and not fully formed, it’s bound to make an impression. Tummy time not only takes the pressure off, but also allows babies the ability to strengthen their head and neck muscles. Tummy time entertainment. Not all babies need to be entertained in order to be coaxed into spending time on their tummies. Some are perfectly content to lay there and look around. Feel free, however, to help your baby enjoy this new view of the world by placing toys in front of him, help him prop himself up a bit on his elbows, and even lay down facing him so you can look at, talk to, and even sing face-to-face. Tummy time dissenters. If your baby is a tummy time squawker, as mine was, then don’t be discouraged. Make sure you ask yourself whether your baby’s squawks truly count as cries of distress or rather of effort. While my daughter’s cries certainly had my mother-in-law distressed, in reality my squawking little newborn really wasn’t truly upset, she managed to keep her perfect little round head and build up her tolerance for tummy time while all the while mastering the skill of scooting long before she could even roll, and I have some impressive baby videos to prove it. For good or for bad, parents today are faced with the fast paced nature of both the real world and a virtual one. Much of the virtually continuous stream of information, videos, tweets and texts we receive on a 24/7 basis relate in one way or another to what we can, should, and/or are expected to do to be good parents. And let’s face it – keeping up with all of the modern-day parenting advice would be hard enough even if all of it was fact-checked for us. Unfortunately, this is not often the case, as much of what we hear, see and read is unfiltered, potentially unfounded, and confusingly contradictory. Having spent much of my professional career as a pediatrician increasingly committed to making sense of pediatric and parenting advice in both of these worlds, I have found that what parents often want to know from me is simply how to filter the good from the bad and separate fact from fiction. Knowing that you all are probably as busy as I am, I decided that this week I would distill down to as few words as possible the handful of things I consider to be some of the most well-founded, important things you can do as parents can do to make your kids smarter, safer and healthier. In other words, the following is my list of the “low-hanging fruit” of parenting. Move more. I feel the need to say this because it’s painfully obvious that it has become incredibly easy for our children (and for us) to barely move in the course of any given day. Whether it’s walking instead of driving to school (or work) or taking an evening walk around the block, getting out of the car instead of rolling your way through drive-thrus, or signing up for organized sports, joining a gym, or participating in more vigorous daily exercise regimens – every step counts towards an healthier life style. Use restraint. Literally speaking, I’m simply referring to the use of car seats and seat belts in motor vehicles. With motor vehicle crashes clearly identified as the number one cause of death in children, and the correct use of car seats and seatbelts clearly shown to have a huge impact on reducing motor vehicle-related injuries and deaths, taking the time to buckle up comes with a huge return on your parenting investment. Read. For every parent who has ever asked my opinion on what they can do to help their children become smarter, excel in school, or head down a path of success, reading always factors in to my answer. Reading aloud to babies, toddlers, young children and teens alike not only fosters improved language skills, but also a love of reading that will serve children well for their lifetime. One of my favorite sayings to emphasize this point is that children spend the first few years of school learning to read, and the rest of their lives reading to learn. Sleep. For parents of infants and young children, this conversation usually focuses on getting children to fall asleep, stay asleep, sleep in their own room, and do so without requiring repeated interventions. For parents of teens, the conversation often shifts to too little and too late. But regardless of your child’s age, it is becoming convincingly clear that instilling your child with good sleep habits is not only a good thing for your own chances of getting a good night’s sleep, but your child’s overall health and well-being. Wash your hands…and while you’re at it, remember to cover your cough (preferably with your arm rather than your hand) and vaccinate. The fact of the matter is that while modern day science and research is continually coming up with new medicines, treatments and technologies to improve our families’ health and more effectively treat disease, the simple act of teaching our children to wash their hands (which includes committing to consistently doing so ourselves) remains one of the single most effective things we can do to limit the spread of disease. So is protecting against all of the vaccine preventable diseases. Of all the topics I routinely discuss with parents, sleep has to rank right at the top of the list. This shouldn’t come as a big surprise, given that a good night’s sleep (or the lack thereof) can have a significant effect on just about everything else we do. When it comes to children’s overall health and well-being, it’s hard to sleep through all of the studies that reinforce that teenagers need more sleep (9 hours a night as compared to 8 for adults) in order to perform well at school, and that plenty of nighttime sleep (on the order of at least 10 hours a night) appears to be as important for keeping obesity at bay in young children as diet and exercise. What I want to discuss today, however, isn’t just children’s need for an adequate amount of sleep, but the importance of safe sleep. While there are certainly aspects of safe sleep that apply to older children (bunk beds spring to mind), safe sleep has held a particularly prominent place in the national parenting consciousness every since the 1990s when the identified link between belly sleeping and Sudden Infant Death Syndrome (SIDS) led the American Academy of Pediatrics to recommend back sleeping in 1992. This was followed in 1995 with the official launch of the Back To Sleep Campaign. While over a decade of subsequent parent education efforts have resulted in a dramatic increase in the number of back-sleeping babies (from 25% in 1992 to 85% in 2008), recent years have brought no additional increase in back sleeping. In fact, we may have started to backslide when it comes to insuring babies’ safety while sleeping. In the course of little over a single devastating month back in Feb/March of 2008, six babies died in Douglas County alone – all classified as SIDS attributed to bed sharing and suffocation. While any increase in infant deaths is concerning, to say the least, the good news is that we know a great deal about what we need to do to keep babies safe while sleeping and reduce their risk of SIDS. The much larger task at hand is simply to make sure that all new and expectant parents and infant caregivers know the most effective ways to create safe sleep environments for babies. These life-saving safe sleep tips can also be found in the campaign’s newly released 7 minute video, narrated by renowned journalist Joan Lunden and available for viewing or download on the AAP’s HealthyChildren.org and on the Keeping Babies Safe website. Additional information about safe sleep can also be found on in the newly revised 2nd Edition of my book, Heading Home With Your Newborn (AAP, Sept 2010), and on the Nebraska Department of Health & Human Services Website.